Tiffany Ultimo Managerial Mid-Back Leather Office Chair - Managerial mid-back chair features sculpted dual-density foam, genuine top-grain cow leather upholstery, built-in lumbar support, and leather padded loop arms to help relieve muscle fatigue and stress. Moulded foam maintains its supportive shape by steel-reinforced nylon ties. 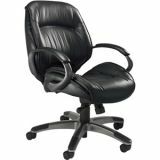 Functions include 360-degree swivel, pneumatic seat-height adjustment, tilt tension, tilt lock and synchronized knee tilt for comfortable reclining. Polished aluminum five-star base offers a powder-coat gunmetal grey finish for scuff-resistant protection. Dual-hooded casters provide smooth, quiet mobility. Mid-back chair holds up to 250 lb. and meets or exceeds ANSI/BIFMA standards.